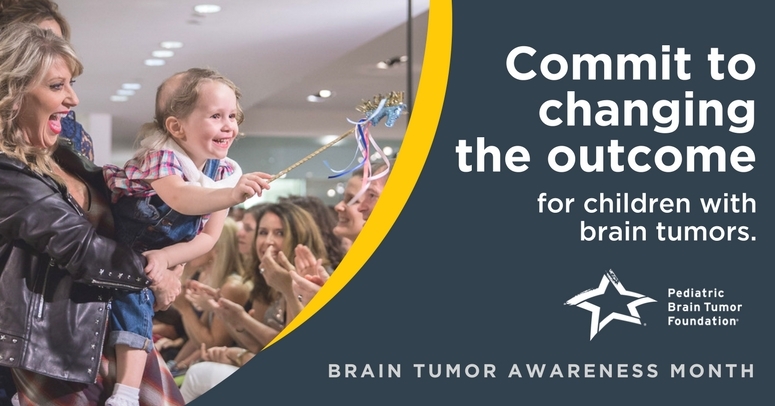 Until all children with brain tumors are cured, the Pediatric Brain Tumor Foundation and the childhood brain tumor community must – and will - do more. Recently, we linked arms with Swifty Foundation, Dragon Master Foundation and Kortney Rose Foundation to raise money for a groundbreaking research project. 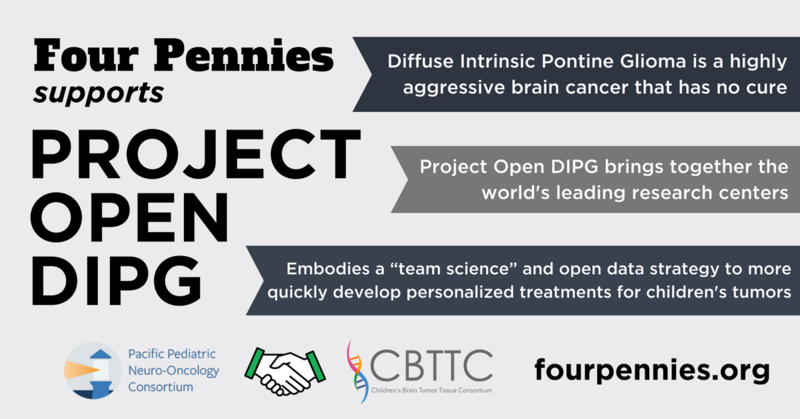 100% of proceeds from our joint Four Pennies initiative will be invested in Project Open DIPG, the largest research project ever done on this aggressive, treatment-defying brain cancer that will serve as a model for future research on all pediatric brain tumors. For Brain Tumor Awareness Month, we’ve made it easy for everyone to change the outcome for children with brain cancer. PBTF fundraisers helped raise over $36,000 in 24 hours on Giving Tuesday. Imagine what you can do in a month! 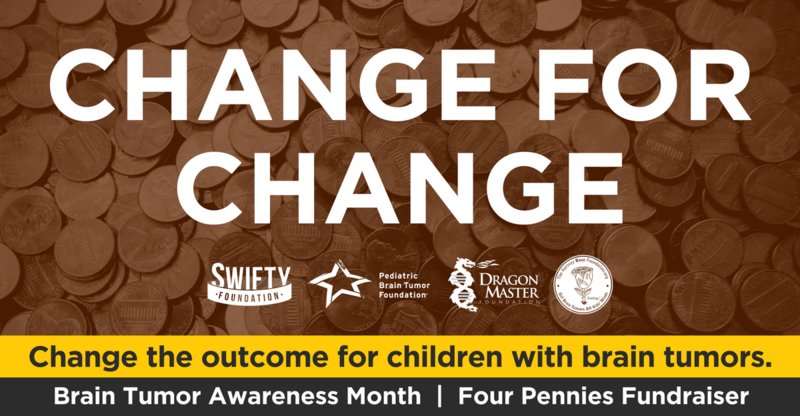 The following Change for Change fundraiser guide offers tools, tips and templates to help you raise money for Four Pennies, with 100% of all fundraising proceeds going towards research. Host a Four Pennies Facebook fundraiser. It’s easy to rally friends and family through Facebook fundraising. Plus, when you select the Pediatric Brain Tumor Foundation as your nonprofit of choice, Facebook's donation processing fees are waived. 1. Set up your fundraiser. If this is your first time fundraising on Facebook, their quick guide will help. 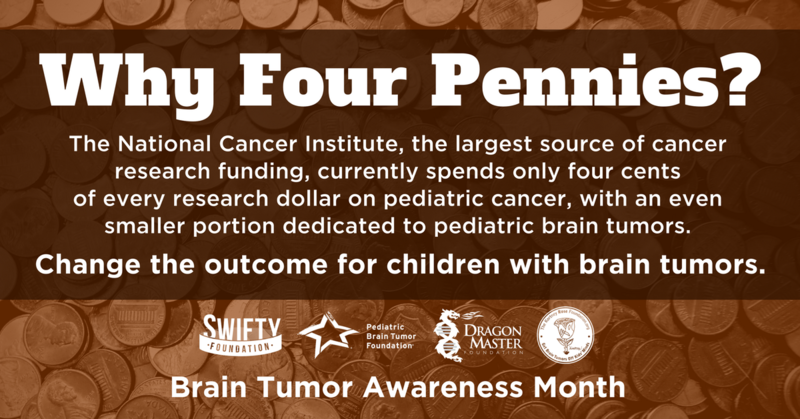 Select Pediatric Brain Tumor Foundation as the nonprofit you’re raising funds for and include “Four Pennies Fundraiser” in your fundraiser’s title so that it can be counted towards this initiative. 2. Customize your fundraiser’s description and cover image. The following text and this Facebook fundraiser cover photo can be used to show you’re part of the Four Pennies effort. I’m raising funds for Brain Tumor Awareness Month to give children with brain cancer the fighting chance they so desperately need. The National Cancer Institute, the largest source of cancer research funding, currently spends only four cents of every research dollar on pediatric cancer, with an even smaller portion dedicated to pediatric brain tumors. Your donation will help the pediatric brain tumor community do more to find a cure. 100% of this fundraiser’s proceeds will be invested by the Pediatric Brain Tumor Foundation in Project Open DIPG, a first-of-its-kind, collaborative research project. Although medical advances in the past 40 years have improved survival rates for many types of childhood cancer, diffuse intrinsic pontine gliomas (DIPG) are not one of them. These highly aggressive brain tumors defy treatment and are always fatal. The research you’re funding is not only the largest research project undertaken for DIPG, it will also serve as a model for research on all pediatric brain tumors. Whether you donate $5 or $500, every cent helps. Thank you for your support. 3. Make it personal. You're asking for money for a good reason - to save children’s lives. Although the template text we’ve provided can help get you started, we recommend sharing why this cause matters to you and your family. 4. Spread the word. After you launch your fundraiser, invite your Facebook friends, email contacts and other social media contacts to donate. And don’t forget to post reminders - it takes an average of 3 asks to get a donation. 5. Show a donation’s impact. Every cent counts in the fight against childhood brain tumors. You'll find information to share about the research project you’re funding here, and the PBTF’s social media toolkit can also help you raise awareness about the cause. Collect change at school, work or in your community. Take your fundraising offline by setting up a Four Pennies' Change for Change drive at work or in school - or partner up with a local business! At the end of Brain Tumor Awareness Month, call 800-253-6530 to make your gift by phone or mail a check or money order in U.S. funds to Pediatric Brain Tumor Foundation, Attn: Four Pennies, 302 Ridgefield Ct., Asheville, NC 28806. Please write ‘Four Pennies’ in the check’s subject line to ensure it is counted towards this initiative. 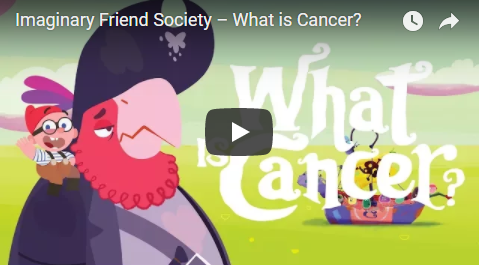 BONUS MATERIALS FOR TEACHERS: Our Four Pennies partners have put together classroom materials about the 2,659-mile hike that inspired the Four Pennies initiative, and the PBTF's Imaginary Friend Society videos can help children understand what cancer is and how to be there for a friend who is in treatment. Of course, the fastest way to support Four Pennies is by donating online. It takes less than a minute to give, and 100% of your donation’s proceeds will be invested in pediatric brain cancer research. Thank you for joining us in funding this important research effort that our children so desperately need.